My first artist grade watercolors were 3 warm primaries and 3 cool primaries - because I wanted to mix my own colors, like I do with procion MX dyes for fabric. Laura, of Laurelines.... was posting some color studies that she did and I decided to spend 6 months, one for each primary and secondary color, mixing my 6 Winsor Newton primary triads to explore a full range of colors. 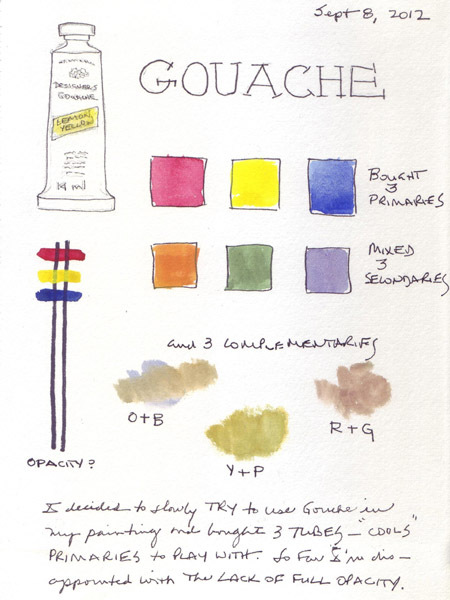 Each month I collected items of the "color of the month" and tried to mix colors as closely as possible to paint them. 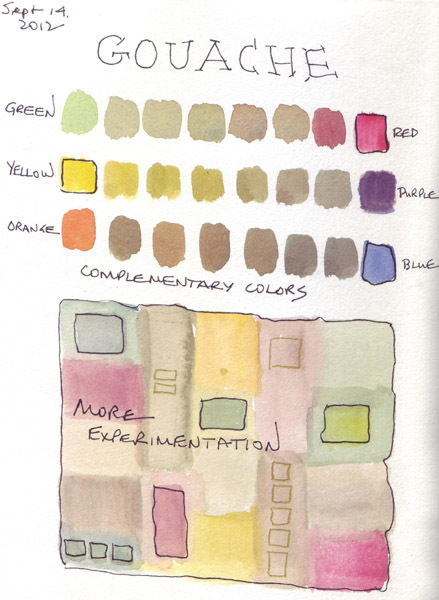 Those sketchbook pages can be seen by scrolling down in the color project category on the right side of my blog - under Archives. Now I'm experimenting with my first artist grade gouache and I spent another wonderful playtime mixing complementary colors from my 3 tubes. The primaries, secondaries created, and some glazing from playtime #1 can be seen here. This time I wanted to mix complementary colors using red + green, blue + orange, and yellow + purple. I didn't spend much time mixing the secondary colors, i.e. I didn't try to match them to colors created in my last playtime. I stayed very loose! My three primaries are all identified in the 3 spectrums. 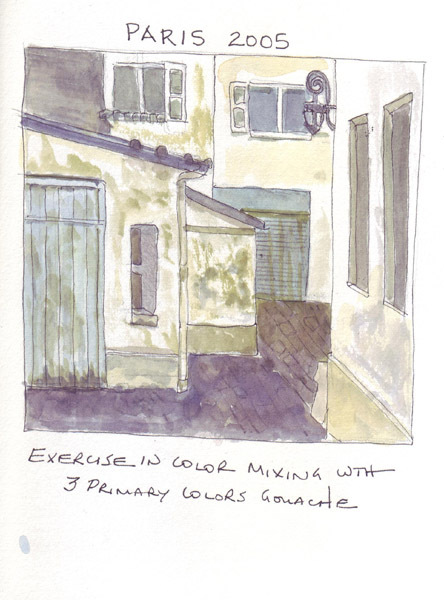 I wanted to try to mix all of the colors in a small sketchbook painting and found a perfect reference photo - a scene near Place des Voges taken by our cousin when the 4 of us were in Paris in 2005. I tried to match the colors in the photo as much as possible, although I still need to work harder to get the darkest gray possible. One turned out too purple and the other too brown. Last Wednesday Pat and I spent the morning at the Met - at the Preview of the new exhibit "Regarding Warhol: Sixty Artists, Fifty Years," and the afternoon at Figure Drawing Alfresco. Since then my days were devoted to our new grandson. 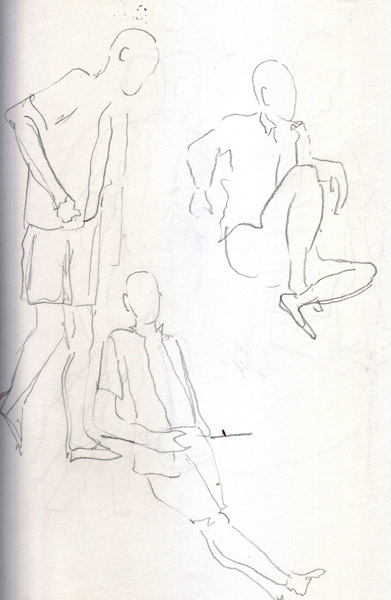 Today I went back to my sketchbook and scanned a few of my sketches for my blog. I like that we begin the session with 10 one minute sketches. The time goes VERY QUICKLY and I barely breath while trying to capture an image. I know these are exercises for warming up, but I still like to define the position of the model. John uses a park bench very effectively in his poses. Two minute sketches: The coordinator of these sessions tries to remind us not to slow down or our two minute sketches will look just like our one minute sketches. I love being reminded, because my tendency is to slow down instead of using the extra time for refinement. Twenty Minute Painting: I hoped that I could draw figures with my paintbrush - sometime in the future. For the last year I sketched models with my watercolor pencils, and then painted them with water for shading. Our model John reclined on a big rock, with the Hudson River lapping on the seawall behind us and I finally decided that I was so relaxed that I would draw him with my brush. 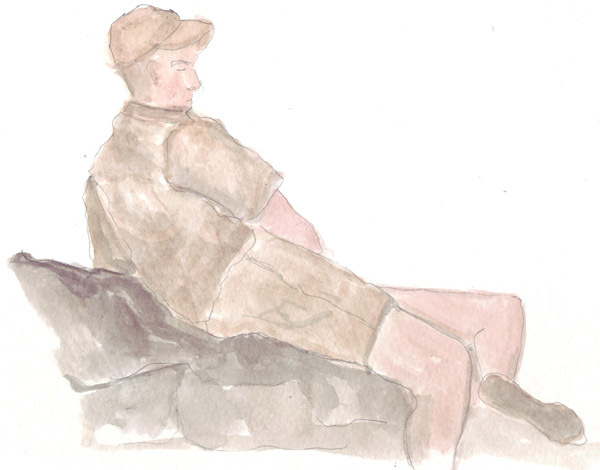 Unfortunately he was dressed completely in beige and the rock was light gray, so there is NO range of values in my painting. The faint drawing that can be seen is pencil added after the paint. Couldn't resist it! But I DID draw with my brush! 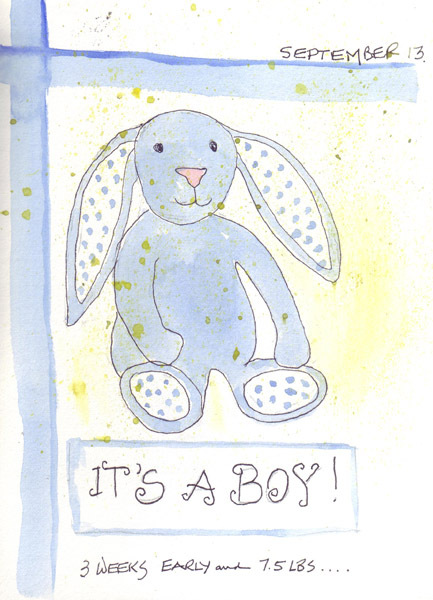 Our oldest son and his wife just had their third child - 3 weeks early. Mommy and baby are fine and we saw the baby for a few minutes last evening shortly after birth. 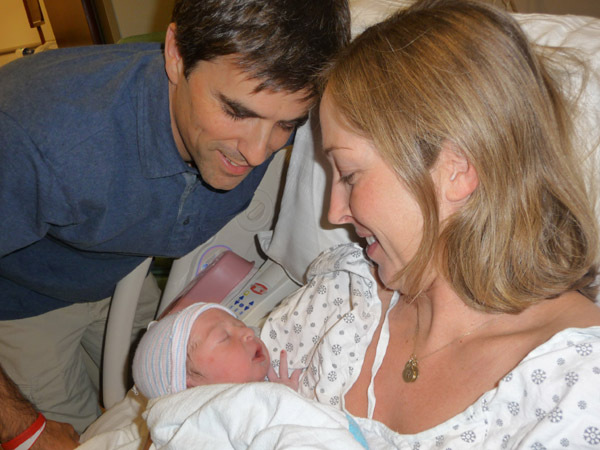 This is their 3rd boy - and our 8th grandchild among our 3 children. We feel so lucky and love being grandparents. The baby's 2 brothers and their 3 cousins, who also live in the City, were as excited about the new baby as the adults! I love watercolor, and still haven't fallen in love with acrylic paint. So I decided to slowly buy some Winsor-Newton gouache in one cool primary triad, and to play with them before buying a warm triad. I bought Lemon Yellow, Permanent Alizarin Crimson, and Ultramarine. It will take me awhile to decide whether I want to invest in more tubes - until then I will play. Here are color samples of the 3 primaries, the mixed secondary colors, and one quick mix of complementary colors. I will explore the full range of complementary colors that are possible, but just wanted to see how close I could get to mixing shades of gold and brown. I also did a quick opacity test and was surprised that the Crimson wasn't more opaque. 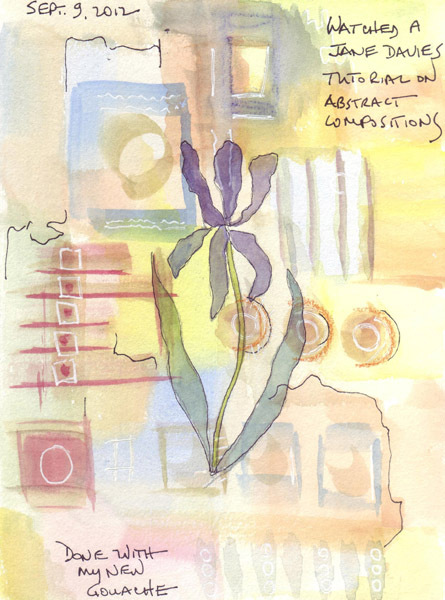 Jane Davies posted a tutorial on the Sketchbook Challenge blog last week, using acrylics and pens to create abstract paintings, and I watched it right after I bought my paints. It seemed like a great way to test my 3 primaries and the range of colors I could mix - as well as assessing the ability to glaze in layers and cover some of the background paint. I recycled a discarded $1.00 book entitled Artist and Model and now have watercolor paper in it to practice figure drawing from photos. 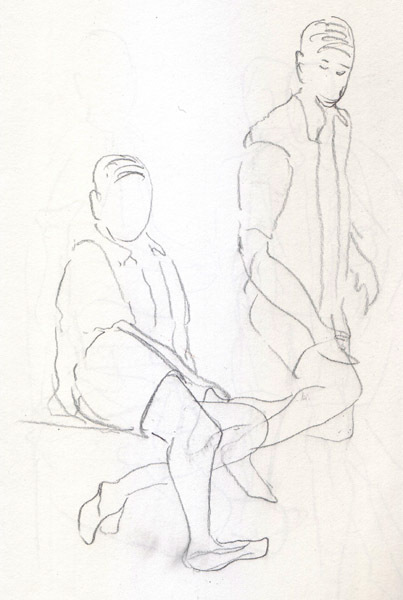 I snip photos from magazines, especially hands, feet, and faces to practice drawing. I also love to copy drawings from the Masters. Nancy Tasker (from the Everday Matters online art group) and I decided to exchange images from the Masters and this week I copied her John Singer Sargent drawing of Myra Hess. Myra was a British pianist who was well known for establishing more than 150 lunchtime concerts in the National Gallery in London during the Blitz. Concert Halls were closed and these lunchtime concerts significantly raised British morale. 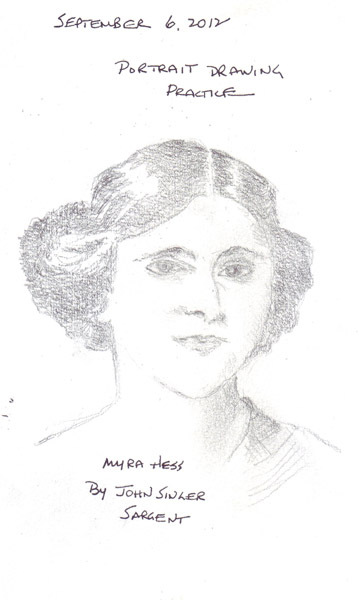 I searched for images of Myra Hess with Google this morning and found another artist who used the Sargent drawing for his drawing practice. 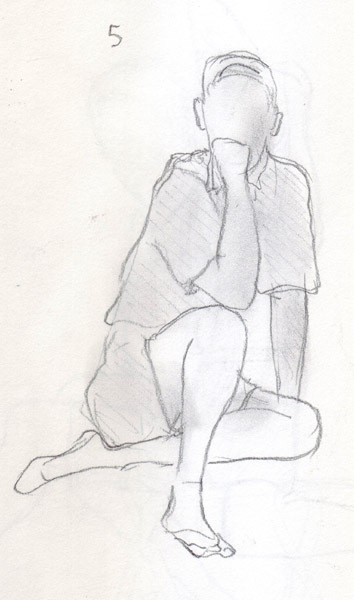 I can't wait to go back and look at his blog, the most recent blog post was about the benefits of drawing daily! When our daughter and her family were living in London, we discovered Sargent's studio/home in her neighborhood, so drawing this brought back fond memories of a wonderful walk and gorgeous home. Here is my photo. 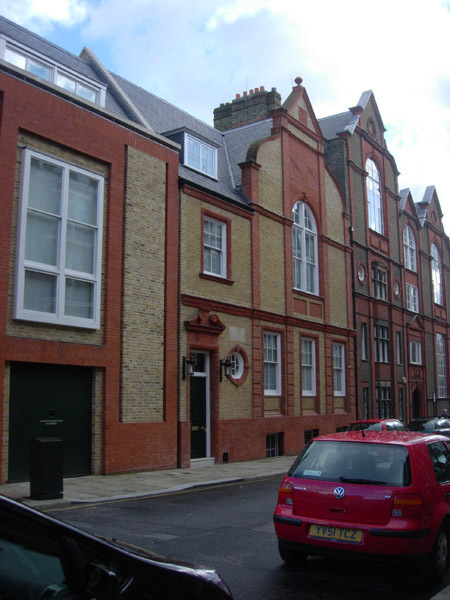 31 Tite Street to the Left and 33 to the Right. Oscar Wilde lived at 34. I keep magazine photos of hands in my Artist and Model sketchbook so I can draw them when I have nothing to paint in my daily sketchbook. These hands were drawn while I was watching the evening TV coverage from the Democratic National Convention. 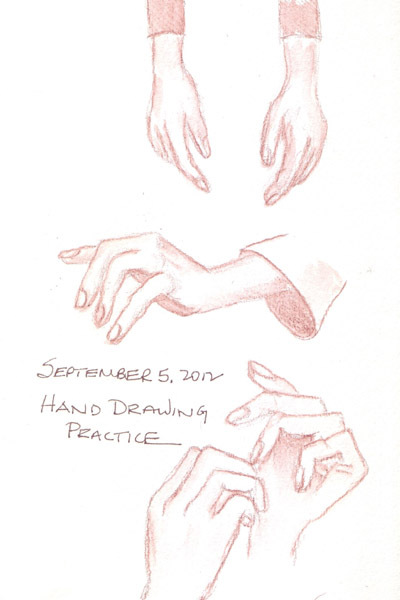 If only my drawing practice made a bigger difference when I'm drawing hands on live models!